PhotoStories 3. Each of photographs has its own story. Especially the one you get from the plane. We offer to you a new series of PhotoStories taken by the USA 2016 expediton. Today story of the Rock formation in the vicinity of Lake Powell – Utah. Lake Powell is a result of Glen Canyon Dam construction on the river Colorado. The dam was built in the years 1956-66 and as can be seen on the Google Earth view it follows the shapes of the various rocky valleys and formations. Today, it is one of the most attractive recreational area and the second largest water reservoir in USA. 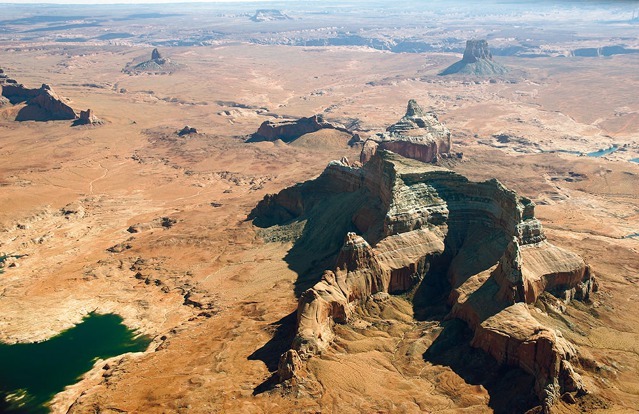 North of Lake Powell is situated the famous Monument Valley. This photo taken during our expedition Around USA 2016 shows a tip of Lake Powell and the closest characteristically shaped rock formations betraying the vicinity of Monument Valley. Flying over the national parks of the West of USA offers fantastic sensations of unbelievable proportions and endless space.